I think the idea of feathered edges on a piece of footage that was cropped with standard Premiere Pro crop effect is as old, as the crop effect itself. I know that I’ve been waiting for Adobe to make it since I started using their software, which means version 6.5 of Premiere (not yet “Pro” then). And I know I’m not the only one. How many of you have fallen prey to the hope that “feather edges” effect would actually work as it should with cropped footage? 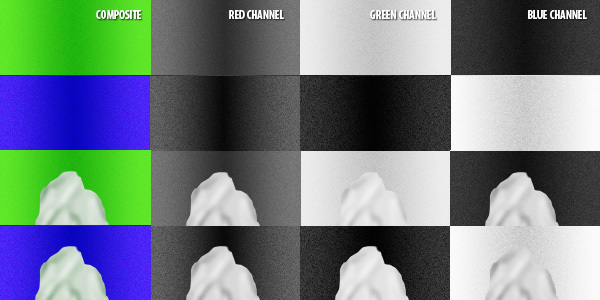 Or wished for more control than blurring the alpha channel via the “channel blur”? Or used titler or photoshop pictures as track mattes? Fortunately, there’s no more need for this. Not because the guys from Adobe actually decided to focus their efforts on this non-critical, although pretty non-complicated, task. Drawing on my background of a would-be computer scientist, physicist, and – of course – video editor, I decided to delve into the dreaded Premiere Pro/After Effects SDK, and created the effect myself. So, without further ado – here’s the Feathered Crop effect that I’ve written. It seems to be pretty popular (even more than the Vignette) and has gone through a few iterations already, each one adding new functionality. The effect is free, but I appreciate donations, especially if you like the results that you are getting. I’d like to thank everyone for their generous support, and kind words. Enjoy! SpeedGrade seems like a very promising addition to Adobe Creative Suite, which I have already mentioned. However, after playing with it for a short moment, I found with regret that it does not fit our current infrastructure and workflows. Below is a short list of what kind of changes that I consider pretty important. These requests seem to be quite common among other interested parties, judging by the comments and questions asked during Adobe SpeedGrade webinar. First, as of now the only way to output a video signal from SpeedGrade is via very expensive SDI daughter board to nVidia Quadro cards. This is pretty uncommon configuration in most post facilities. These days a decent quality monitoring card can be bought for less than 10 times the price of nVidia SDI. If the software is to gain wider popularity, this is the issue to be addressed. Adobe seems to have been painfully aware of its importance, even before the release. I’m sure that had it been an easy task, it would have been accomplished long ago. Unfortunately, the problem is rooted deep in the SpeedGrade architecture. Its authors say, that SG “lives in the GPU”. This means that obtaining output on other device might require rewriting a lot – if not most – of an underlying code – similarly to what Adobe did in Premiere Pro CS5 when they ditched QuickTime and introduced their own Mercury Playback Engine. Will they consider the rewrite worthwhile? If not, they might just as well kill the application. Second, as of now SG supports a very limited number of color surfaces. Unless the choice is widened to include at least Avid Color, and new Tangent Elements, it will push the application again into the corner of obscurity. Third, the current integration with Premiere is very disappointing. It requires either using an EDL, or converting the movie into a sequence of DPX files. It’s choice of input formats is also very limited, which means that in most cases you will have to forget about one of the main selling point of Premiere – native editing. Or embrace offline-online workflow, which is pretty antithetical to the flexible spirit of other Adobe applications. The integration needs to be tightened, and (un)fortunately Dynamic Link will not be an answer. 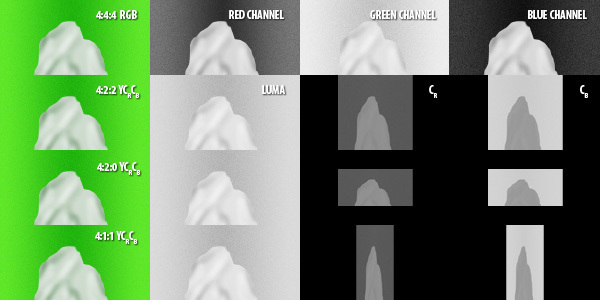 DL is good for single clips, but a colorist must operate on the whole material to be effective. Therefore SG will have to read whole Premiere sequences, and work directly with Premiere’s XML (don’t confuse with FCP XML). It also means that it will have to read all file formats and render all the effects and transitions that Premiere does. Will it be done via Premiere becoming a frame server for SpeedGrade, as is After Effects for Premiere when DL is employed? Who knows, after all, Media Encoder already runs a process called PremiereProHeadless, which seems to be responsible for rendering without Premiere GUI being open. A basic structure seems to be in place already. How much will it conflict with SpeedGrade’s own frame server? How will effects be treated to obtain real time playback? Perhaps SpeedGrade could use Premiere’s render files as well? An interesting glimpse of what is to come can also be seen in an obscure effect in After Effects which allows to apply a custom look from SpeedGrade to a layer. Possibly something like this is in store for Premiere Pro, where SG look will be applied to graded clips. The question remains, if the integration will follow the way of Baselight’s plugin, with the possibility to make adjustments in Premiere’s effect panel, or will we have to reopen the project in SG to make the changes. This tighter integration also means that export will most likely be deferred to Adobe Media Encoder, which will solve the problem of pretty limited choice of output options presently available in SpeedGrade. As of now SpeedGrade does not implement curves. Even though the authors claim that any correction done with curves can be done with the use of other tools present in SG, curves are sometimes pretty convenient and allow to solve some problems in more efficient manner. They will also be more familiar to users of other Adobe applications like Photoshop or Lightroom. While not critical, introducing various curve tools will allow SG to widen its user base, and will make it more appealing. Talking about appeal, some GUI redesign is still in order, to make the application more user friendly and Adobe-like. I don’t think a major overhaul is necessary, but certainly a little would go a long way. Personally I don’t have problems with how the program operates now, but for less technically inclined people, it would be good to make SpeedGrade more intuitive and easier to use. These are my ideas on how to improve the newest addition to Adobe Suite. As you can see, I am again touting the idea of the container format for video projects – and Premiere Pro’s project file, being an XML, is a perfect candidate. Frankly, if SpeedGrade will not be reading .prproj files by the next release, I will be very disappointed. We’re using XDCAM EX in mp4 wrapper and NXCAM (AVCHD) files which Resolve does not support. Transcoding is necessary although it’s the subject for another entry. Time remapping in Resolve is much worse than even in Premiere, not mentioning After Effects. All speed changes should be rendered and replaced before exporting XML. Some effects should be rendered, but transitions should be left untouched. All Dynamic Link clips should be rendered and replaced. Traverse the timeline, looking for clips having properties mentioned in points 2-4. Create a new video layer or a sequence, whatever would be faster. Copy the clips there one by one and queue export for each to desired codec, encoding timecode and track either in metadata or the name. After the export is done, it would import the renders, and replace old clips with the new ones. Alternatively, I could have one script to export (1-3), and another to reimport (4). See? It’s relatively simple. The possibilities of scripting are almost infinite. For example, I could also change all the time remapped clips automatically into Dynamic Linked AE compositions and render them using its superior PixelMotion algorithm – although I would rather appreciate Adobe including it in Premiere itself, getting rid of the old and awful frame blending. I could even attempt to change them to their Twixtor equivalents, although I must say that my experience with this effect is pretty crashy. I looked at SDK for Premiere Pro to see if I could write a plugin that would make this job easier, but as far as I know such possibility does not exist. Plugin architecture for Premiere is pretty limited, and compartmentalized, and using C++ for this seems like a bit of an overkill. Recently I was doing a small editing job for a friend, and ran into a few interesting problems. The footage provided was shot partially on a Canon Powershot, which saves it as an AVCHD MTS stream. My computer is not really up to editing AVCHD, so I decided to transcode the clips into something less CPU intensive. 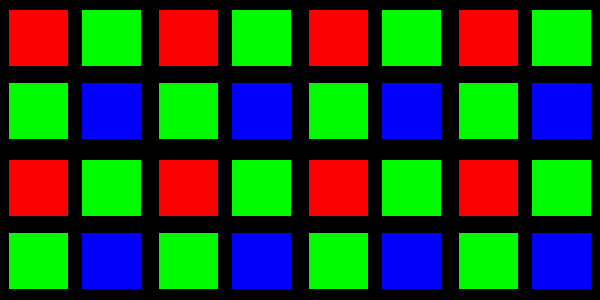 The final output would be delivered in letterboxed 640x480p25 because of the limitations of the second camera, so the quality loss was of little concern. Having had decent experience with AVID’s DNxHD codecs, I decided to convert it to 1080p25 36 Mbps version. And then, the problems began. Even though Premiere Pro did import the file without a problem, Adobe Media Encoder did hang right after opening the file for transcoding. I decided to move the footage to AVID thinking that perhaps it would be a good project to hone my skills on this NLE, but it was complaining about Dolby encoding of audio, and didn’t want to import the footage. I then tried to use Sorenson Squeeze to convert it, but it also threw an error, and crashed. Even the tried MPEGStreamclip did not help. I was almost going to give up, but then came up with an idea to use Premiere’s internal render to transcode the footage by putting it on an XDCAM HD422 timeline, rendering it (Sequence -> Render Entire Work Area), and then exporting it with the switch that I almost never use – “Use previews“. I figured, that once the problematic footage is already converted, then the Media Encoder will handle the reconversion using previews without problems. I was happily surprised to have been proven correct. And because Premiere’s internal renderer was able to cope with the footage without a glitch, it all worked like a charm. 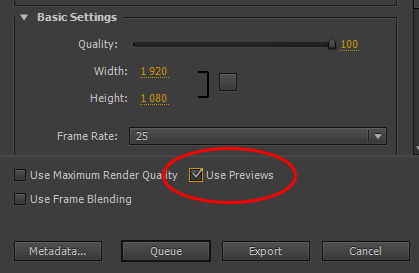 “Use Previews” can sometimes save not only rendering time, but also allow for encoding problematic files. Afterwards the edit itself was relatively swift. I encountered another roadblock when I decided to explore DaVinci Resolve for color grading, and exported the project via XML. Resolve fortunately allows custom resolutions, so setting up a 640×480 project was not a problem. I also had to transcode the files again, this time to MXF container. This was a minor issue, and went relatively fast. However, due to the fact that some media was 480p, and some 1080p, and I have done quite a lot of resizing and rescaling of the latter, I wanted to use this information in Resolve. Unfortunately, Resolve did not want to cooperate. It’s handling of resize was very weird, and every time I clicked on the resized clip to grade it, it crashed. I’m certain that the scaling/panning was responsible, because when I imported the XML without this information, everything worked great. It might have something to do with the fact, that I was running it on an old GTX260, but still, I was not able to use the software for this gig.